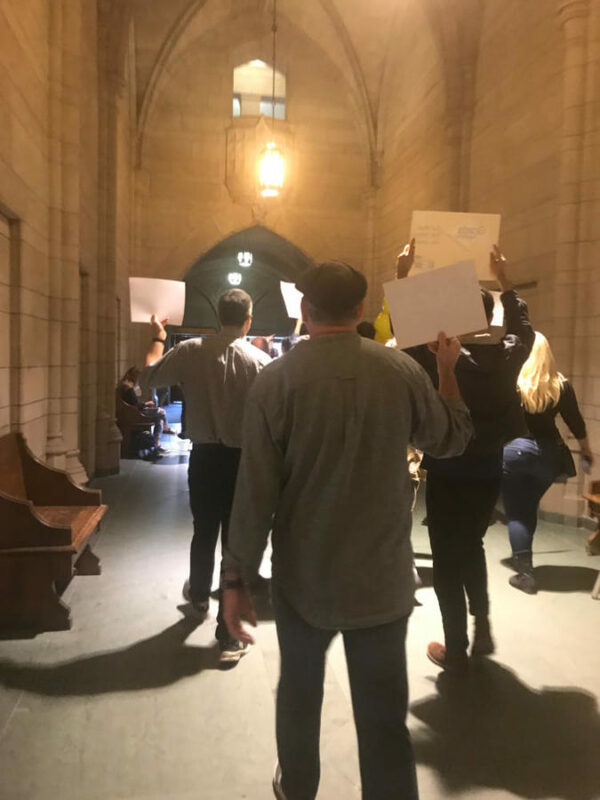 As grad students and faculty gathered outside Chancellor Patrick Gallagher’s door in the Cathedral of Learning Tuesday afternoon, a Pitt police officer cut a path to the front and addressed the crowd. “Who’s in charge here? Where’s your leader?” he asked the people clutching signs and cameras outside the chancellor’s office. A man filming the spectacle on his phone outside the door spoke up. “We don’t have one, we’re a democratic union,” he said. Just inside the office door, union organizer Beth Shaaban spoke to Gallagher’s executive assistant, Alison Wateska. 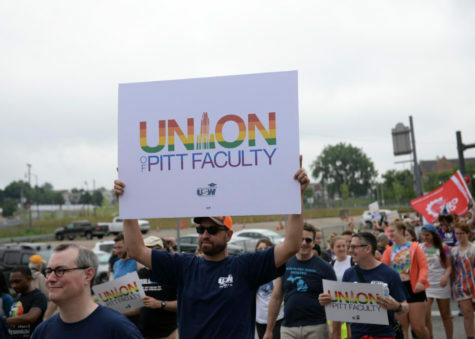 This protest is one of many held since both Pitt faculty and grad students officially announced their separate campaigns to unionize with the help of United Steelworkers. 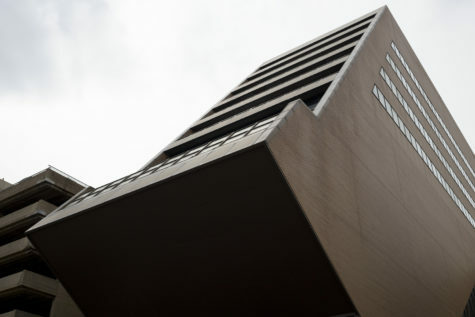 Since the January 2016 announcement, the union organizing committees have been marshaling support from their colleagues, collecting interest cards and staging protests. Tuesday’s gathering ended with delivering Gallagher seven letters from elected officials, expressing their support of the union and their hope that the Pitt administration would remain neutral. 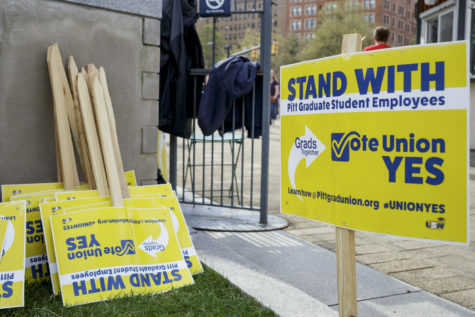 The University has remained neutral on the faculty union, but spoke out against the grad student union campaign in July. Provost Patricia Beeson, speaking on behalf of the administration, said a student union would negatively affect relationships between grad students and their faculty, departments and schools. 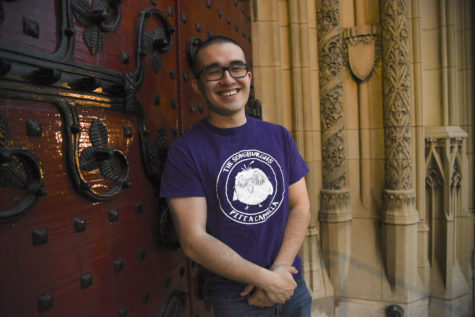 Shaaban — a student in the School of Public Health and a member of the graduate student union organizing committee — gave letters to Wateska from political figures in the Pittsburgh community and beyond. Letter writers included U.S. Sen. Bob Casey, D-Pa., and U.S. Rep. Mike Doyle, D-Pa. In an email Tuesday, Shaaban said the union has also garnered support from three city councilmembers and 15 state representatives. Shaaban said the union has also reached out to Mayor Bill Peduto for his support, and is expecting to receive it soon. 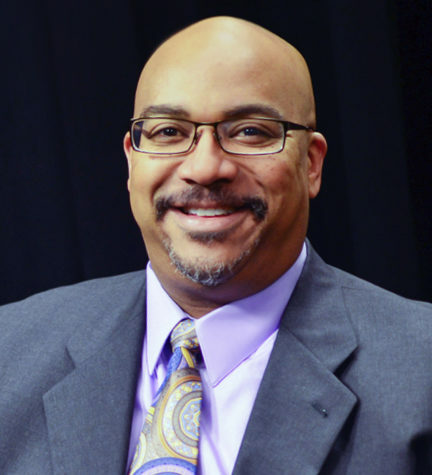 Doyle’s letter called on Gallagher and the Board of Trustees to remain neutral, to not spend tuition money or public funds on “anything that could be construed as anti-union activity” and to form a joint committee of union organizers and University representatives to discuss the issue. 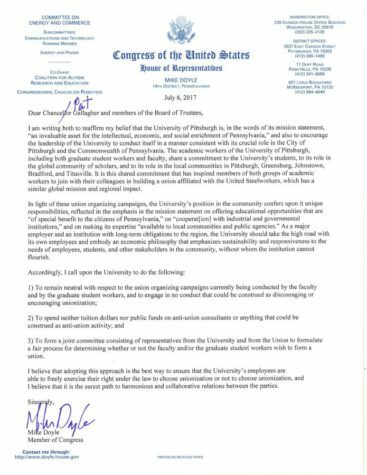 “I believe that adopting this approach is the best way to ensure that the University’s employees are able to freely exercise their right under law to choose unionization or not to choose unionization,” the congressman said in the July 6 letter. Doyle’s Letter delivered to Chancellor Gallagher. 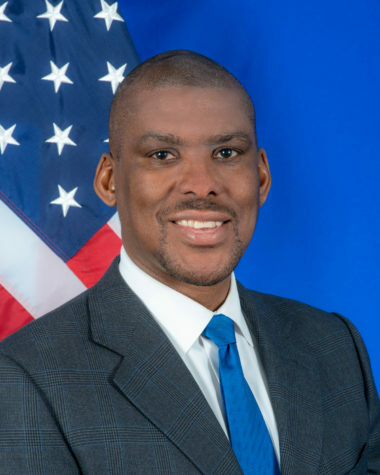 University spokesperson Joe Miksch said it was normal procedure for the police to inquire after a representative at the protest in order to determine what the group represents and what they were seeking. The protest began in Schenley Park around 1 p.m., with organizers from both organizing committees and representatives from United Steelworkers chanting “What do we want? Neutrality! When do we want it? Now!” and waving banners and signs while crossing Forbes Avenue. The cheering protesters then made their way up the front steps of the Cathedral and to the Chancellor’s office within. 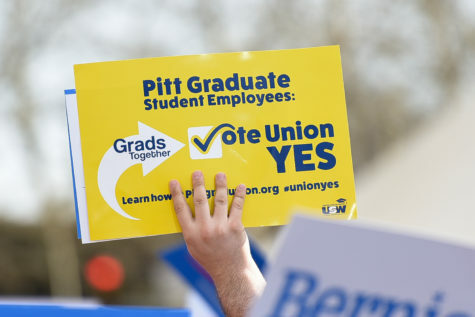 Some of the issues the faculty and grad student union organizing committees are campaigning for are better wages, more job security and increased protections regarding academic freedom. 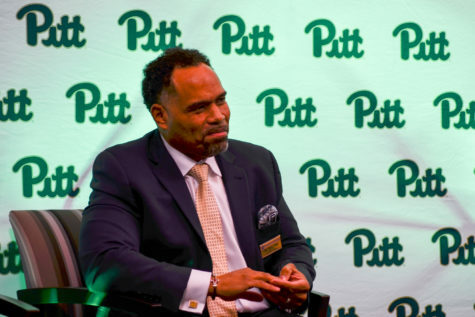 According to William Scott, an associate professor in Pitt’s English department, each of the letters urged the University to adopt a position of neutrality in regard to the grad student and faculty union organization efforts currently underway. Shaaban said the event was not meant to serve as a response for anything the administration has said or done. 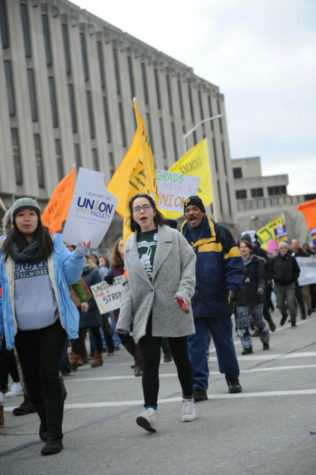 Abby Cartus, a student organizer studying in the School of Public Health, said union organizers started reaching out to local officials over the summer. Shaaban said the main point of the event was to show the University administration that the campaign is both publicly and politically supported. “We’re here to exercise our constitutional rights, to show that we have a right to unionize and that we’re supported in that,” she said. Editor’s note: A previous version of this article said “dozens of letters” were dropped off at the chancellor’s office. This is not true. 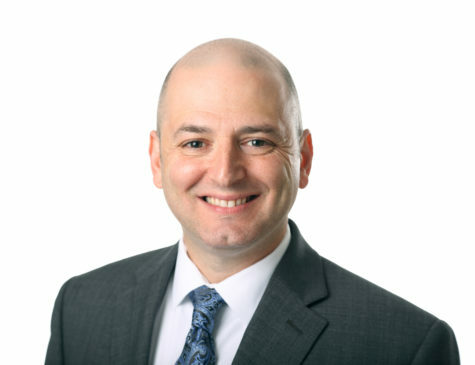 According to Joe Miksch, a spokesperson for the university, the chancellor only received seven letters. 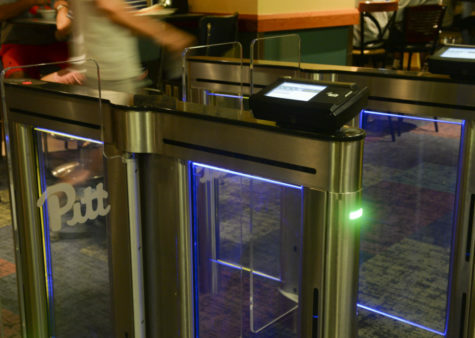 The Pitt News regrets this error.